A Facebook user identified as Modesta Chinomso, has taken to the social networking platform to recount how God saved her from being hit by a stray bullet in Imo state. The young lady disclosed that she was sick and home resting while she awaits results of the test which was done the previous day. All of a sudden, she heard some sounds and her curtain railings fell on her on the bed. 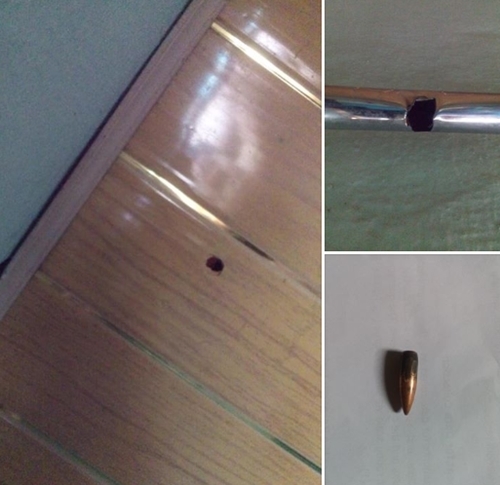 She said that as she stood up to fix the curtains, she could not believe her eyes when she saw a stray bullet laying on the bed she stood up from. She added that she began to trace the small metal and found out it came through the ceiling, pierced the curtain railings before hitting the mattress. "Was suppose to go out yesterday as usual but couldn't because i was battling with high fever and cold so i decided to stay back rest while waiting for my result from the laboratory i went the previous day. "Lying down on the bed at 10:30am i heard a thunderous sound inside my room and the cotton hanger polled from it spot and fell my me, i quickly got up and behold a bullet lying next to me..
"That kept me wondering what could have happened, so i began to trash the mysterious bullet root into the room, it pieced through the roof down to the celling, hit the iron hanger and lost it strength on the bed."